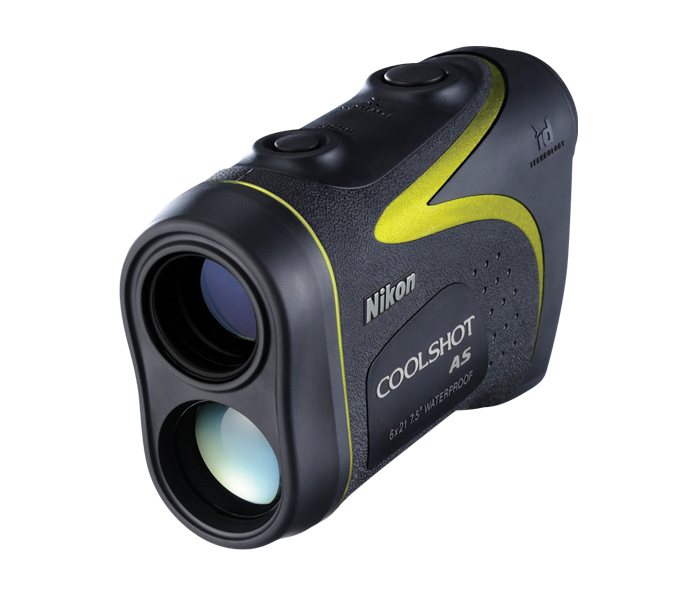 The COOLSHOT AS Golf Laser Rangefinder combines Nikon’s legendary optical performance with some of the most advanced distance measurement technologies available today. It features the all-new Golf Mode with ID (Incline/Decline) Technology to provide you with the slope-adjusted distance for an accurate reading for uphill or downhill shots. Get the slope adjusted distance for any uphill or downhill shot, thanks to the all new Golf Mode – found only in Nikon’s COOLSHOT AS rangefinder. By utilizing Nikon’s highly advanced ID Technology, you can be confident that you have an accurate angle-compensated distance, so that you can select the right club and hit the ball at the proper trajectory. Knowing your personal yardages for every club will give you an extra advantage when facing difficult shots during play. By using a COOLSHOT AS Laser Rangefinder to learn your distances while you train, you’ll gain the precise knowledge you need to improve your score on the course. On those warm summer days on the course, even the lightest golf bags can seem like a load. That’s why the COOLSHOT AS was designed to be extremely lightweight and compact. It can be stowed conveniently in your pocket or attached to your bag, you’ll hardly even notice the six and a half extra ounces of this portable laser rangefinder. The COOLSHOT AS rangefinder features Nikon's advanced technology that allows you to simply scan across the backdrop of the green until the flag or pin yardage displays the closer distance. With 8-seconds of continuous ranging with a single push of the button, there is no need to worry about the effects of hand-shake interfering with getting the distance to the pin. The large 18mm ocular provides a faster view -- meaning less time taking measurements and more time making shots. You’ll also enjoy the comfort of the long eye relief and a wide field of view. With its sleek body design and precision laser rangefinder technology, the COOLSHOT AS is nothing short of high-tech. Using it, however, could not be easier. Simply press and hold the ranging button to get an instant distance reading.